Frontiers has reached the publication milestone of 20,000 high-quality, peer-reviewed articles across its growing “Frontiers in” journal series. Frontiers has reached the publication milestone of 20,000 high-quality, peer-reviewed articles across its growing “Frontiers in” journal series, confirming its position among the five leading open-access publishers worldwide. This great achievement was made possible by the unified effort of Frontiers’ growing community of 45,000 editors and 100,000 authors from 140 countries. Frontiers published its 5,000th article in March 2012, its 10,000th article in February 2013, and its 20,000th in May 2014 and is predicted to reach 30,000 publications towards the end of the year. Now a high-volume, high-quality player, Frontiers continues to be one of the fastest growing scholarly publishers. “Scientists are ready for a change in scholarly publishing and the strong growth of the Frontiers journals, all run by active academics, indicates support for a community-driven approach, where researchers work together to accelerate scientific and medical progress,” says Kamila Markram, a neuroscientist and autism researcher at the Swiss Federal Institute of Technology Lausanne and Co-Founder & CEO of Frontiers. The “Frontiers in” journal series currently publishes 46 community-run journals in 29 academic fields in science, medicine and engineering. From 2013 to early 2014, 16 new journals were launched, including Frontiers in Public Health, Frontiers in Marine Science, and Frontiers in Physics, which are rapidly gaining the support of the research community at large. 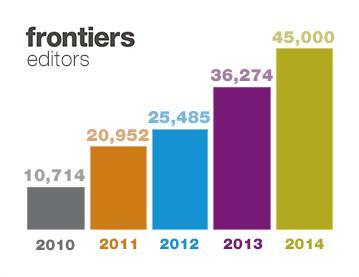 Frontiers journals are among the most established in their subject areas, both in numbers of publications and in citation levels. Frontiers in Psychology is the largest journal in the field of Psychology and Frontiers in Immunology, Frontiers in Physiology and Frontiers in Plant Science are the largest and most highly cited open-access journals in their fields. This demonstrates that the unique peer review at Frontiers, with its interactive Review Forum, delivers high-quality publications and results in significant citation levels. Founded by scientists in 2007, Frontiers empowers researchers with a unique publishing model and open-science tools to increase the reach and impact of their work. “Frontiers is run for scientists, by scientists because science is best served when researchers collaborate. That is why we facilitate synergies between academic communities through the community-run “Frontiers in” journals, our collaborative Review Forum and research networking platform and more,” adds Markram. 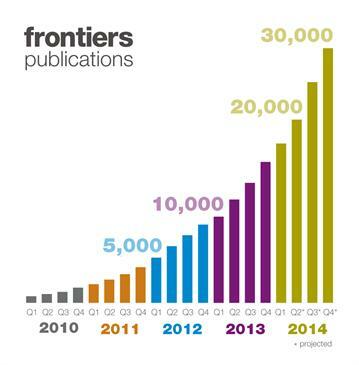 Read more major milestones in the Frontiers 2013 Progress Report here.